Last week, I hopped across the pond with my good friend, Katie for a quick visit to a city I had been dying to go back to since my first visit three years ago, Amsterdam. After 3 days filled with dutch pancakes and stroopwafels, we headed to England. It was my first time visiting London. I decided it was time to go and congratulate Harry and Meghan since I regrettably was unable to attend The Royal Wedding. HA! Ok, but all joking aside… even though I only had two days to spend there, I was so excited to explore London for the first time! I’m not sure that 3 days in Amsterdam and 2 days in London quite qualifies me to write an entire city guide… But! We did cram quite a lot in and I want to share that things you absolutely DO NOT want to miss when visiting these two awesome cities! This charming city built on canals has so much to offer. Sometimes, I feel like Amsterdam gets a bad rap because so many people think it’s just a city with weed and prostitutes…. The first time I visited, I didn’t expect to fall in love with this place… But the charming architecture, small, quiet streets, adorable bridges, house boats, flowering bushes and countless bikes hooked me quite instantly. The second I left, I couldn’t wait to come back. This time, we explored non stop for 3 days. We did a lot, but of everything we did THESE are the things you do not want to miss when visiting this quaint city in Holland. This was a game changer! I didn’t rent a bike on my first visit here, but this time Katie and I did. It was THE BEST way to see the city and was so much fun! We were able to cover so much ground in such a short time. We originally rented them for only 3 hours but ended use extending for 24 hours because we loved it so much. We lucked out with beautiful weather so it made it that much better. It also didn’t get dark until about 10:30pm so you could bike to dinner and back in the light. Amsterdam is swarming with bikes so just make sure to pay super close attention and always follow the traffic signals meant for bikes. One thing to note is that mopeds are also allowed in the bike lanes so always stay to the right so that they can easily pass you. We rented from Black Bike Rentals. It was 17 euros for 24 hours and there are 13 locations. You can pick up and drop off at any of these locations which made it super convenient. There are tons of options when it comes to canal cruises. We opted for a smaller, more quaint, fun option with Those Dam Boat guys! The boat takes about 10 people and it’s bring your own everything! Rose, cheese, joints, whatever you want! The guides break down any walls and those on the boat become instant friends. We all shared food and drink, laughed and joked around. It was a blast! I actually ended up driving most of the way too, because the captain offered and I figured, why not! My favorite area in Amsterdam is called the nine streets. It’s a series of teeny streets along the canals filled with tons of amazing cafe’s, restaurants and shops. You’ll have a blast wandering in and out of shops and testing different lattes. Take the time to visit the Anne Frank house to fully understand this extremely important piece of history. It’s an incredible experience and something you don’t want to miss. It’s a great way to keep that vital piece of history alive. MAKE SURE to buy tickets wayyyy ahead of time online. You CAN NOT buy them at the museum. It sells out every day so don’t forget to plan ahead here. I don’t think this one needs much explanation… Holland was Van Gogh’s birthplace and they have the most unbelievable collection of his work. This is something you absolutely don’t want to miss when in Amsterdam. Buy your tickets online in advance to avoid the lines. Head to a local market to pick up some goodies for a park picnic! Ride your bikes through vondelpark and find a nice shaded spot by the water to relax, eat and drink! This was one of my favorite afternoons of our trip! Dutch pancakes are a classic dutch dish (obviously). Similar to crepes, but slightly thicker and not quite as sweet they were one of our favorite things we ate this trip. I found our spot for them via my friend Ashley’s Amsterdam travel guide and it DID NOT disappoint! The Pancake Bakery was out of this world! Savory pancakes are more common in Amsterdam but they do of course have sweet as well. We decided tog get one of each and share. A ham and cheese pancake and a banana nutella. I only have one word, heavenly. This fabulous food hall is worth the small trek to get there. There are tons of amazing food stands, bars and a super fun crowd! The night we went they had a DJ playing the best throwback songs and people were singing and dancing, it was a blast! I opted for Rosé and dim sum but it was so tough to decide what to eat with so many great options! We went to this beautiful, quiet lunch spot upon our arrival. It has a central location near all the museums and is absolutely gorgeous inside! The food was delicious with an even more beautiful presentation. Amsterdam is super famous for the Indonesian food. We kept being told we had to try it, so of course, we did! Our captain on the canal cruise recommended this awesome spot where we ate outside. It was so flavorful and delicious! The best fries in Amsterdam! This walk up spot near the Red Light district will change your french fry life. They have dozens of sauces to choose from. We went with the Mannekin sauce… They explained it as a little sweet and a little spicy. I’d rather not know exactly what it was because it was so darn good and I didn’t want to make myself feel guilty! HA! Ok so, sadly… we left this for our last day and it was closed. SO! We actually didn’t get to try it but I’ve heard from so many different people that this is the spot for stroopwaffles so I still had to include it here. Next trip to Amsterdam I’m not missing this one!!! Pop in one of the locations (they’re all over) and get some aged Gouda! Amsterdam is known for it and it’s unreal delicious!! I don’t eat dairy (most of the time) but this cheese was so tasty that I couldn’t say no. I honestly didn’t really know what to expect with London. It’s one of those places you hear so much about and see all the in movies, on TV etc. (anyone else grow up obsessed with What A Girl Wants)? Well, like a mentioned previously, we only had two days here but oh my gosh was it a fun 2 days. The city is quite spread out but Uber was fairly inexpensive and the tube was easy to navigate! These were our highlights and things I would absolutely recommend doing when in London. If you’ve never been to London you can’t come and not see the sights. Buckingham Palace, Westminster Abbey, Big Ben etc. We again lucked out with beautiful weather and walked this whole area. It’s really so hard to comprehend the size and beauty of these famous sights until you see them in person. My mind was blown and we had so much fun playing tourist! If you have bearable weather, walking through the royal gardens is quite magical. They are expansive and peaceful. Make sure to stop at an ice cream stand for a soft serve to walk with… because doesn’t an ice cream cone make everything more fun? In my opinion, Notting Hill is even more charming than you could imagine! Beautiful, whimsical, filled with colorful homes and endless vintage stores, it’s picture perfect and definitely worth a visit. Whilst in Notting Hill, make sure to wander up and down Portobello road. The market is adorable and has everything from fruit and flower stands, to local artisan goods and the touristy London socks and magnets. The street itself is also filled with gems. You’ll find fun little coffee shops, restaurants, stores and vintage shops galore. We totally lucked out. 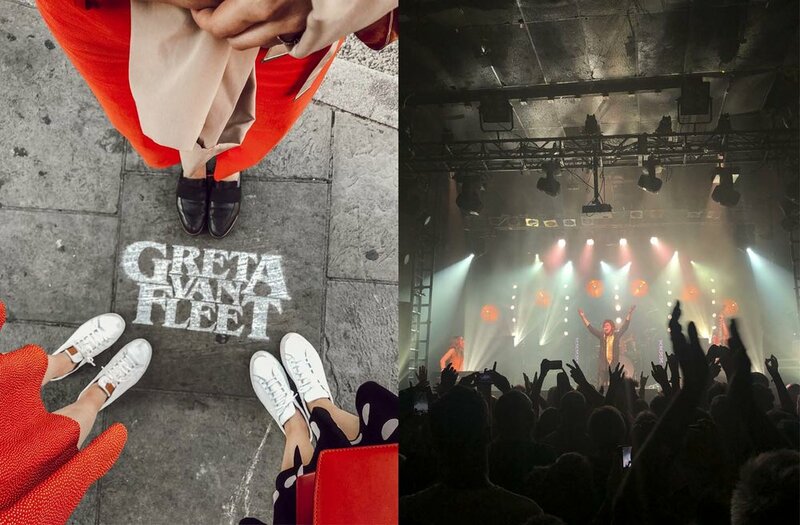 One of my favorite bands, Greta Van Fleet happened to be playing London one of the two nights we were there. It was so fun and such a different scene to go to a show in England! We loved seeing all of the brits and their uniquely British hair cuts and trousers! If you picture an British person at a rock concert in your head, that’s exactly who filled the venue! The concert was amazing to say the least. Greta Van Fleet was just as good if not better live than people say. We danced all night! Yes yes, Hamilton is playing in London! This is something we didn’t think about until later on so we didn’t have tickets before going. But! We did learn that it’s much more affordable in London, so buy tickets way in advance!!! Tickets start at only 20 pounds! Katie and I had both seen it once and were both dying to see it again. We went to the theatre as our first stop when we arrived in London to try and buy tickets but it was sold out. The nice lady at the box office let us know that they get returned tickets every night, but never know how many will come. There is a queue that forms each night of people hoping to snag these return tickets. It’s all super regulated to avoid scams and they have the system down. Nobody gets their tickets until they get to the venue to go to the show. That means, no counterfeit tickets, no buying them on craigslist, no buying and reselling to make money. If you can’t go to the show, you can go to the venue and they will walk you to the queue to sell for (face value or lower, but never for profit) to someone in the queue. The show was at 7:30 and we got in the queue at about 5:05. We were #11 & #12 in line. They said on average they see about 7-9 tickets returned each night but we decided to be patient. Most tickets that got returned ahead of us were singles so groups got split up. We agreed that we still wanted to go even if we got split up. 7:15 rolled around and we started losing hope. We were now #3 & #4 in line. The first people had all gotten tickets at this point. About 10 minutes before the show started, the employee came out with a guy selling two tickets together! The guys ahead of us said they wouldn’t spend more than 30/ ticket so when they came back with a pair at 89.50 each we were in luck!!! We asked if he would take 70 each and he said yes! We quite literally jumped up and down, hugged him and ran to the theatre! We grabbed champagne to celebrate and had huge grins on our faces as we held back from singing and both said the second time around was maybe, if it’s possible, even better than the first time. It was how we spent our last night in London and I couldn’t imagine anything better. I’d been dying to visit Sketch for quite sometime and it did not disappoint. We went to the gallery (the gorgeous pink room you see all over Instagram) for high tea. It was an incredible experience. They really make it a full experience with extreme attention to detail. All of the employees are so charming and play different roles. They wear matching outfits spending on what job they have. . My favorite was the caviar man. He wears a pink suit and straw hat and matches the room perfectly. We asked him “how are you” and he said with his sweet voice and accent: “I was slightly bored but life is much better now that I’m speaking with you.” Surely, he says this to every table but it was just so absolutely charming. We drank champagne and lots of tea, ate fancy mini sandwiches and too many pastries and almost cried because the live violinists played so beautifully. It’s kind of pricey but if you’re able to visit, I can’t recommend Sketch enough. Honestly, I don’t know where to start with this one. I’m hungry just writing the name of the place!!! My friend Whitney (The Blonde Atlas) lived in London and we took a ton of her recommendation. (Check out her full London guide HERE). When I chatted with her on the phone a couple weeks ago she said, do you like curry? The answer is hell yes. She responded with, “if that’s the case there is one place you absolutely have to go in London… Dishoom.” We obliged. We went for dinner our first night and instantly fell in love. We went again for lunch the next day so that should tell you something. They take reservations up until 5pm and if you’re going for lunch or an easy dinner, a reservation is a MUST. If you go after 5pm expect a pretty hefty wait any night of the week. There are a handful of locations so find the one closest to you. In the course of 2 meals we tried a ton of different dishes. My very favorites were the Chicken Ruby (get a side of basmati rice) and the Pau Bhaji. Please just trust me and order those two things along with everything else that sounds good. Another one of Whitney’s amazing recommendations, this little Australian spot in Notting Hill was charming and delicious. It was the perfect spot for a healthy, delicious breakfast and unique latte (the lavender latte is actually purple) . We loved Farm Girl. Tucked away behind an unassuming light blue door up Portobello Road, this spot was another picture perfect one. We had a blast on this whirlwind 5 day trip! I love both Amsterdam and London and can’t wait to visit both cities again! If you have any questions, as always, feel free to reach out! If you’re spending more time in these cities and looking for recommendations I high recommend Ashley of Sed Bona’s Guide to Amsterdam HERE and Whitney of the Blonde Atlas’ Guide to London HERE! No matter how great the trip, it’s always so great to be home.